I wanted to begin this blog two years ago when I started cycling. I thought I could cover the build up from new cyclist to competing at Nationals. Last year I did make it to a few club races, took part in the 100km round Lake Dunstan and ended the season as senior woman champion. Only because I was the only woman older than 35 on the day and completed the race despite my chain coming off on the last steep climb to the airfield. But this year – kaboosh. I’ve been away overseas teaching and not cycling. Bobet and I travelling and not cycling. Before we left there were high winds and snow and now we’re home, there has been floods and heavy snow. So this blog is not about how I began training for nationals or even club races anymore. 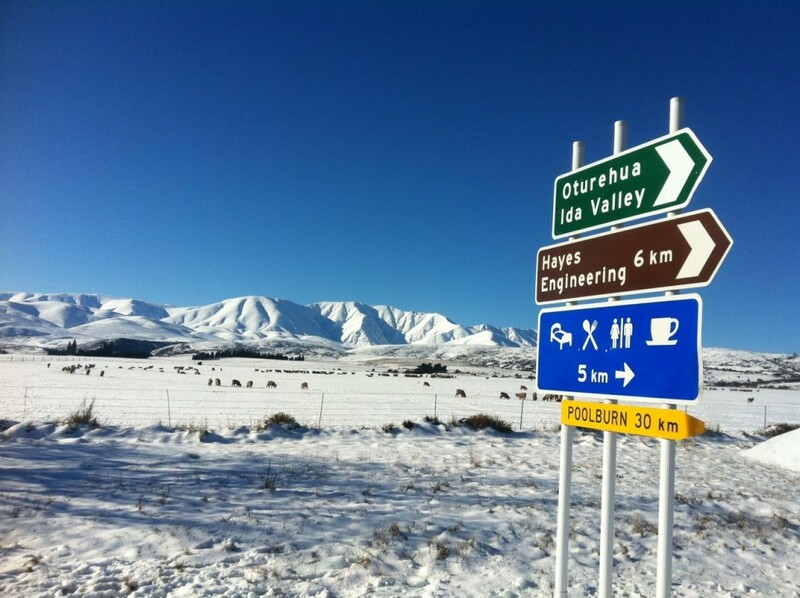 It’s about getting on the bike every few days and what’s happening here in the Ida Valley of Central Otago where we live. I manage to remember what clothing is required for winter cycling. Woollen tights, extra socks, two shirts, two jackets, two pairs of gloves. Helmet and sunglasses. Then gumboots, with my shoes in a bag from the handlebars. My driveway is snow and slush. I wheel the bike out through the mush and down the road to Bobet’s, where he pumps our tyres, the both of us unfit and yet happy to finally be getting back on the bikes. “No Wedderburn for you today,” he says, and I’m pleased about that. It’s a long uphill approach. Not my favourite direction. He chooses the flat valley, beginning with an eight kilometre slight downhill ride. Bobet is the one who seriously wants to get fit and compete. Several times close in the NZ champs, he still has something he wants to achieve. I’m pleased I’m fit enough he brings me with him on his training rides. When I’m unfit like today, he tells me to ride in his lee. Even here, the wind still catches me, and it’s like frost on my face. Note to myself – find a merino balaclava. Just out of the village the road is torn up by last week’s flood. We guide our bikes through the sharp replacement gravel and onto tarseal again. The snow is piled up along the road edge and wherever a stream had burst its banks onto the road, a farmer has already been and dug out the drains. Last week the Ida Burn flowed from one side of the road to the other. 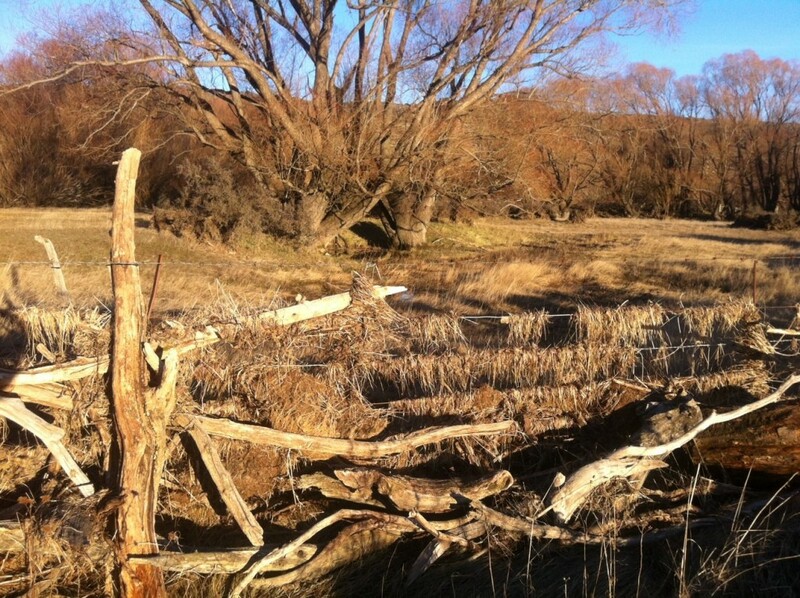 There are logs jammed in the fence lines and tangled dead grass and sticks. The long grass on the road edge is flattened, looking like waves. Only the dead stalks and flowerheads of yarrow stand up straight. Not far from the village the snow has gone. The paddocks are brown, the grass cropped short, and soaked from the floods. In some places there are hollows full of water. We bike past a flock of dirty-fleeced sheep in a bare paddock, the earth dark and wet and the sheep at the edge of a newly opened section of turnips. They’re the only stock to be seen in this whole stretch of the valley or on the slopes of Rough Ridge. Flood debris in the fence along the roadside. We climb one hill by the dam, and further down the straights into a head wind, another sharp hill. Now I feel the lethargy of my body, the slowness of my legs. A gap opens up between Bobet and me and several times he has to call out “Are you there?” and then crane his neck back when he doesn’t hear me close behind him. “I’m coming,” I call, and press down harder on the pedals to catch up. We decide to turn not long after the second hill. My neck turns more easily so I cross the road and call back to him “You’re ok.” Then because he doesn’t catch up immediately I put the bike in top gear and pedal hard down the hill. The wind is behind me and for a few moments I feel capable of anything. When Bobet catches up, calling out I burned him off, he keeps up the pace. My exuberance used up, I settle in to doggedly keep up with him. It reminds me of how cycling mostly is for me (and probably life, writing, love and any other aspect of living) – moments of illumination and deep joy and the rest keeping at it as best you can. When we pass the sheep again the air is full of the smell of turnips. Back through the gravel section and the Ida Burn still high and muddy, though the logs jammed under the bridge have been excavated and piled on the bank. In the village there are sandbags outside the first houses, and snow piled up in the gutters and on the footpath. The Hawkduns are whiter than I’ve seen them, rich with snow. A weak sun lights their flanks but doesn’t take the chill from my face. At Bobet’s gate I’ve had enough. He has more residual fitness and he carries on up the valley a while. On his lawn, I remember to pull my foot sideways out of my pedal and not fall onto my side under his clothesline, the way I have before. So this expertise at least I have retained. A paltry 16k. It’s a start.